Scented candles set the mood for a Halloween party. 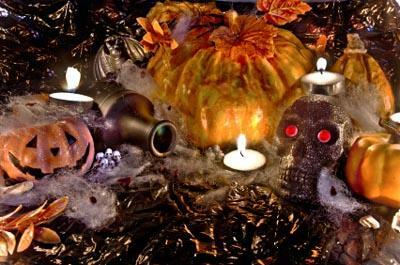 Making Halloween scented candles is a great way to get into the spirit of the holiday. Scented votives also make excellent party favors for grownup trick-or-treaters! Pumpkin: Nothing says Halloween like a pumpkin scented candle. Candy corn: A scented candle is a sweet treat that won't wreck your diet. Chocolate: Obviously, if trick-or-treating is your favorite part of Halloween, a chocolate scented candle is sure to evoke happy holiday memories. Apple cider: The fun and festive apple cider fragrance is a great choice for burning candles at a Halloween party. Orange: A citrus scented candle is a light, happy choice for Halloween. If you want to give it a more gothic appeal, try making an exotic orange and clove combination. Cinnamon: A spicy cinnamon candle is a good choice for Halloween, since this fragrance transitions well into Thanksgiving. Patchouli: Some people find this fragrance a bit overpowering, but it's great for setting a spooky Halloween mood. Sandalwood: A soulful scent, amber mixes well with vanilla for a unique Halloween candle. Vanilla: Although it's often thought of as an everyday candle scent, vanilla can be appropriate for Halloween candles when mixed with spicy or musky fragrances. When making your Halloween candles, keep in mind that it's important to take careful notes regarding how much fragrance oil you've added to each batch. If you find a scent combination you like, you want to be able to duplicate the results at a later date. As a general rule, it is best to make your candles using one tablespoon of oil per pound of wax melted or three percent of the candle's weight. However, this formula may be adjusted slightly to accommodate individual preferences. To add a special touch to your candle making project, consider using your favorite spooky fonts and free Halloween clip art to make custom homemade candle labels. Halloween Candle Wraps: Beaded candle wraps make it simple to customize your candles to better fit your home décor. This project is also easy enough for young crafters to help with. Decoupage Halloween Candle: Decoupage is a great technique for decorating many surfaces, including Halloween candles. Faux Stained Glass Candle Holder: Faux stained glass candle holders are appropriate for many occasions, including Halloween. Make a Halloween Candle Using Simple Rubber Stamping Techniques: If you have Halloween rubber stamps available from other craft projects, this is an excellent way to decorate an otherwise plain looking pillar candle.